OMTEX CLASSES: Define Internet forum and its structure. Define Internet forum and its structure. Definition: Forum is the space on internet used to communicate, interact and collaborate with others. e.g. It is possible by means of discussions, chat rooms, messaging windows, calendars. A forum is structured combination of sub forums, topics and post which fall under specific categories. 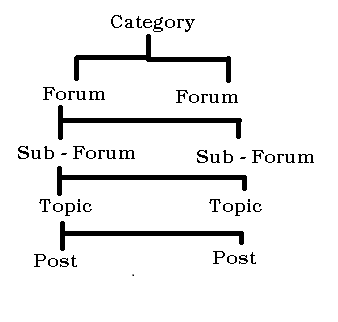 A forum consists of a tree like directory structure as depicted as below.